This recipe for Chicken Caprese Salad is a new favourite of mine because it is seriously packed full of flavour and I can’t stand a bland salad. The basil, garlic, lemon and oil (or apple cider vinegar if you’re making the syn free version) all come together to really bring out the flavours in the fresh tomatoes and compliment the chicken perfectly. The whole recipe is then offset by the creamy mozzarella and pulled together by the salad leaves, making it all in all a total success. 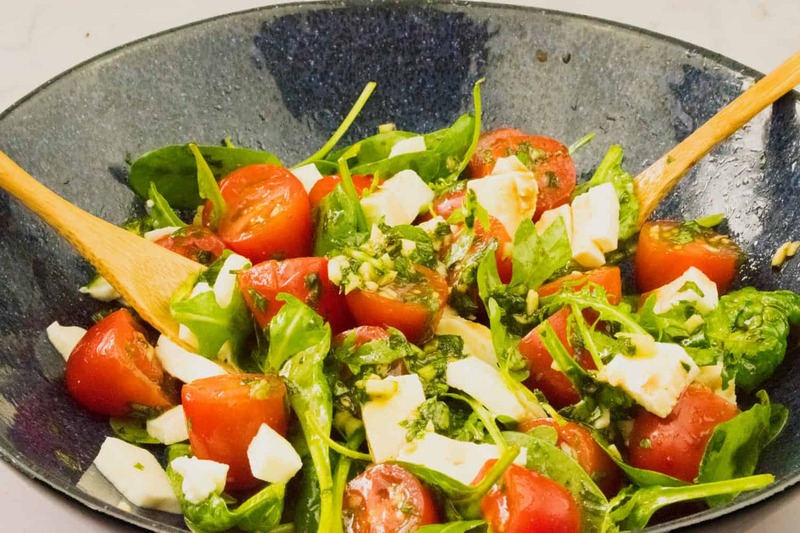 The thing that I really adore about this Caprese salad is just how much you can pack into something that only takes 15 minutes to put together. It is the ideal lunchtime recipe, whether you’ve meal prepped it or are simply making it at home. 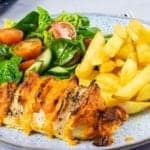 What’s more, you can cook the chicken separately, for instance as part of a roast dinner, and make the salad portion of the recipe as a side dish for everyone to enjoy! Simply times the recipe by the number of people you’re serving and you’re laughing! The thing that really makes all of the difference with this recipe, is making sure that every element is coated in dressing. 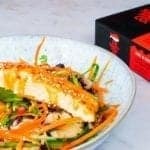 The best way to do that is to approach it in a backwards fashion, starting with the dressing and then adding the salad ingredients in, tossing them as you go, to get everything well and truly packed with flavour. 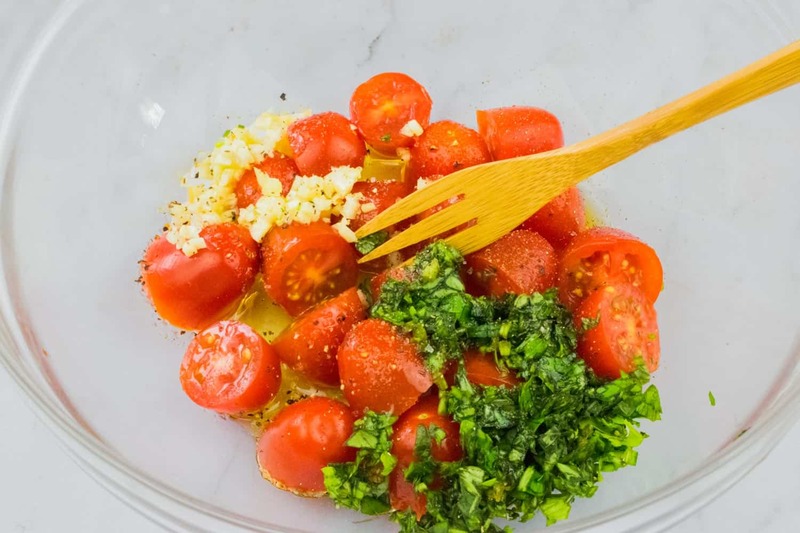 Whether you opt or apple cider vinegar or olive oil in this dressing, your Caprese salad is guaranteed to pack a punch, particularly with the raw garlic! I for one love raw garlic, but it’s not for everyone, so if you would prefer to cook it first you can always give it a little stir fry with some cooking spray for a minute on the hob… it’s totally up to you! 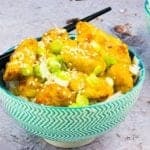 Is This Recipe Slimming World Friendly? Slimming World is by no means all about salad, in fact that’s one of the most appealing elements of the plan for so many people. However, sometimes you just want a bit of fresh, light food in your life and this salad is perfect for those moments. As I’ve said above, there are two ways to make this Chicken Caprese Salad, one of which contains syns and one of which is syn free. 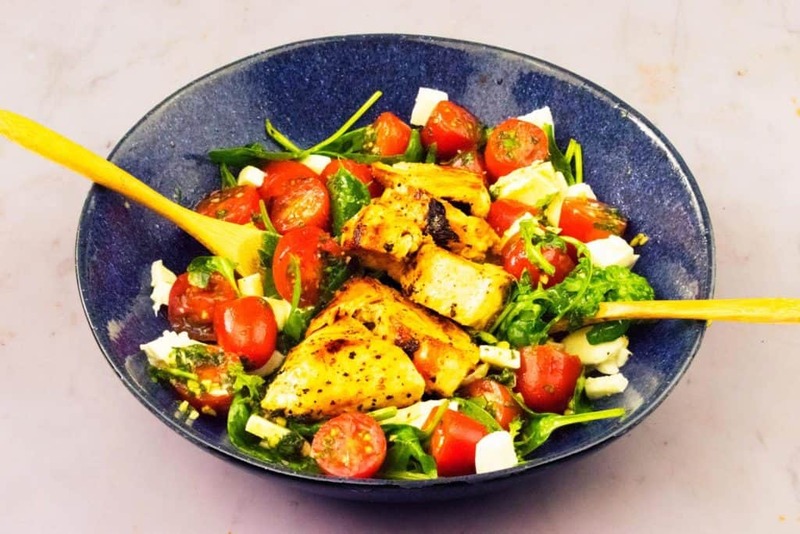 To make this recipe completely 100% syn free, you will be making your salad dressing using a mix of apple cider vinegar and lemon juice. For the synned version (which contains 6 syns) you use a tablespoon of olive oil instead. Either version can be enjoyed as part of the Slimming World plan, the former simply uses no syns. In each version, however, you need to count the mozzarella in this recipe as your full Healthy Extra A. If you prefer, you could swap the mozzarella for a low-fat option, at which point you could either count an additional 25g or only use half of your Healthy Extra A… it’s totally up to you! Personally, I’m focusing on using more healthy fats in my diet and trying to remember that fat is not an enemy food group, so olive oil and full-fat mozzarella are healthy ways to use my syns, but everyone follows the plan differently and so that’s why I’m giving you as many options as possible! 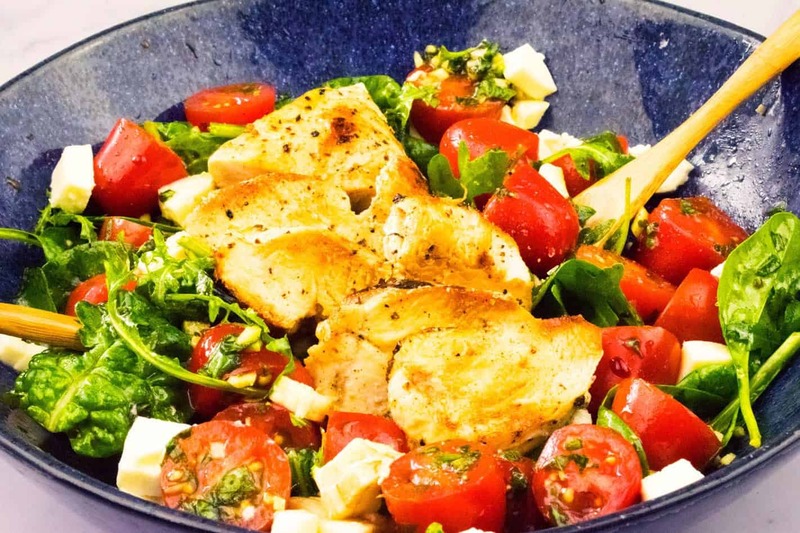 If you are making this Chicken Caprese Salad recipe and following any other diet plan, such as KETO or calorie counting, I have included the nutritional information below. With 44g of protein, it’s a great choice on KETO particularly. 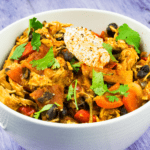 The recipe is 527 calories and serves one person, making it a filling but super healthy lunchtime option if you’re keeping within a calorie controlled diet. 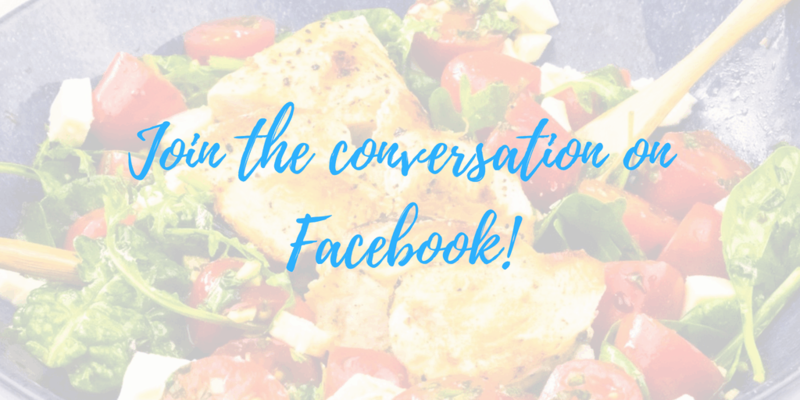 Head over to my Facebook page to share your pictures, ask questions and find other healthy recipes to try at home! 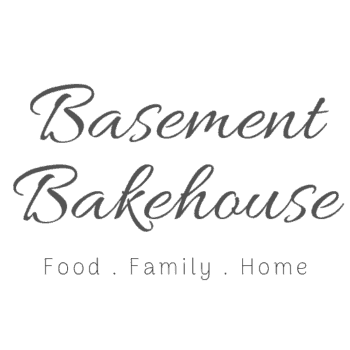 You can also share your photos on Instagram and tag @basementbakehouse_sw where I will try and repost them for you! 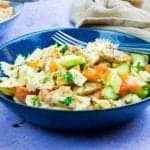 I really hope that you enjoy making this Chicken Caprese Salad recipe, whichever version you choose to make! It’s one that I’ve already made twice since putting it together this week and I will be making time and time again. A healthy, delicious chicken caprese salad with both a synned and syn free option. Over a medium heat, spray a frying pan with low calorie spray and add your chicken. Cook for 5 minutes on each side until brown, and then transfer to your oven and cook for a further 10 minutes or until cooked through. Meanwhile, finely chop the fresh basil and mix it together with the olive oil OR apple cider vinegar and lemon juice mix. (NB: Olive Oil is synned on Slimming World - use apple cider vinegar plus lemon juice for a syn free version of this recipe). Add the garlic to the basil dressing and pour over your halved cherry tomatoes in a small bowl. Season with salt and pepper. Mix the rocket and spinach in with the tomatoes gradually, tossing as you go to coat the leaves in plenty of dressing. Remove your chicken from the oven when it is cooked through and slice into strips. 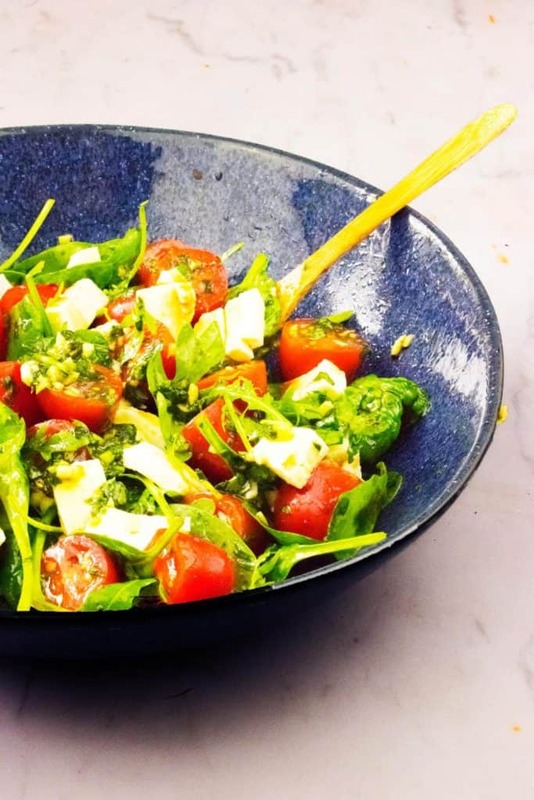 Turn your salad out into your bowl and add chopped mozzarella. Add your sliced chicken and then drizzle on any leftover dressing from the mixing bowl to get the most out of your flavour. Eat straight away for a fresh, healthy salad! If cooking with olive oil this recipe is 6 syns. If cooking with apple cider vinegar this recipe is syn free when using your Healthy Extra A. 50g of Mozzarella counts as your Healthy Extra A. Add six syns if you do not count it as such. 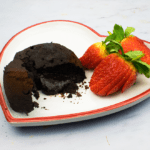 See recipe for additional nutritional information. DON’T FORGET TO PIN THIS CHICKEN CAPRESE SALAD RECIPE FOR LATER! 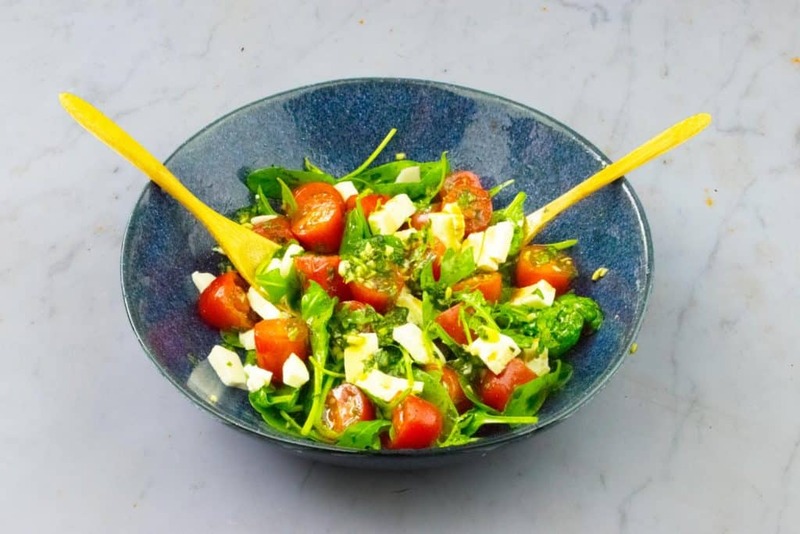 I love easy and this salad looks wonderful I eat salad everyday for lunch and always looking for a new recipes this is perfect! I'm always looking for simple salads to take to work. This one looks perfect. I'll be testing it out next week. This is my favorite salad in the summer. The ingredients are so fresh and flavorful and when you put them together its magical. I love a good caprese salad. This sounds delicious! This looks delish. The turning point for me in salads is chicken. I love this. Thanks for sharing. Quick question I know there is google but just curious to know what slimming world recipes are all about. I have tried to google it but have never really settled in the digest it.